Evolving out of the fetish-Electro-project Seelenkrank in 1998, the group around mastermind Chris Pohl, one of the scene’s most prolific workaholics, was planned as a crossover of genres and emotions right from the start. Elements of electronic Pop music and Euro Dance are delicately mingled with the symbolism, the themes and the romantic appeal of the Gothic novel and the classic horror film. Add to that a wee bit of fetish eroticism and you get a catchy and highly addictive, yet alluring mixture. That the “dark side”, if presented in the right fashion, can have a solid mass appeal should become clear to anyone who looks into the success story of the vampire motif in the pop culture of the 20th and 21st century. In Blutengel’s music, dark imagery and romantic horror stories about vampires, death and the quest for eternal life are set to a musical backdrop that – be it dance- oriented or basking in pompous elegies - will have you hooked instantly. Blutengel draw a lot of their special appeal from the canny interplay of the sexes. Chris Pohl’s female band mates manage to always set an intriguing counterpoint to his glittering presence, both optically and acoustically. In the ten years past, Chris was the only constant member of the group, but he has always been able to surround himself with equally charismatic counterparts. In the current line up, he is supported by vocalists Ulrike Goldmann and Constance Rudert, as well as dancer Sonja. From the first album, “Child of Glass”, Blutengel was a highly successful endeavour … and Chris Pohl has been able to increase his following with each subsequent release. After album number 2 “Seelenschmerz” was released in 2001, the demand for live shows of Blutengel became so great that Chris decided that he would have to take the group to the stage. The band had its debut stage performance at the Wave Gotik Treffen 2001 in front of 10000 bewildered fans and has since become one of the most wanted live acts from the “dark scene”, playing all over the globe and being a regular name at all the major European festivals. The next album “Angel Dust” proved that Blutengel’s approach was able to reach an audience far larger than that confined to the limited boundaries of the Gothic scene. The CD instantly shot to the Top 100 of the German Media Control Charts. All following releases: “Demon Kiss” (2004), “No Eternity” (2004), “Oxidising Angel” and the live DVD “Live Lines” were instant chart breakers. Blutengel have managed what other acts can merely dream of: they have arrived in the mainstream without letting any major record company or management twist or change their style … and with an image that stands in harsh contrast to all the boring and bland casting show products. In December 2006, they released the single “My Saviour” which contained 2 tracks with a distinctive hit appeal and which managed to instantly hit the Media Control Charts Top 100 yet again … in a time of year where all major labels tend to send their biggest names into the competition for the X-Mas sales. Blutengel are now working hard on their next album … and an extensive world tour is also in the works. On Friday, the 13th of July, 2007 the band released its next single “Lucifer” in two limited versions, with the new long-playing album "Labyrinth" following shortly after - an album that is easily their most versatile and complex work to date. 2008 marked a very special year for the Dark Pop legend, as Blutengel were celebrating their tenth anniversay this year. The kicked it off with the ultra-limited 7" vinyl single "Winter of my Life" - of which all 500 copies sold out in a buzz - and which was also released as a download in all major online shops. Sporting one of their strongest tracks ever, this single showed Blutengel at their absolute best. But this was not all, of course, and so a new live DVD, aptly titled "Moments of Our Lives" was released at the end of August, 2008 in three versions: a regular double DVD as well as two limited editions, both containing an extra live CD and the deluxe FanBox adding an exclusive T-shirt to the package. The DVD contains one show that is a montage from footage from four different shows, thus conveying real tour feeling. Disc two contains a myriad of extras, behind the scene footage and is a fan's dream come true. But Blutengel are not stopping here. The single "Dancing In The Light" was released in two limited version with different track listings and artwork at the end of 2008 - an enthraling appetizer for the new album "Schwarzes Eis" which is due for release as a double CD (incl. the instrumental concept album "Behind The Mirror") and as a strictly limited 3-CD-box (which also includes a full third album titled "Redemption") in February, 2009. On its most ambitious and versatile album, the group combines the best elements from all their previous releases and carefully takes its sound into uncharted territory without sacrificing its own identity. The catchy, dark Blutengel-sound has matured elegantly ... and yet sounds as fresh and new as it did on "Seelenschmerz." 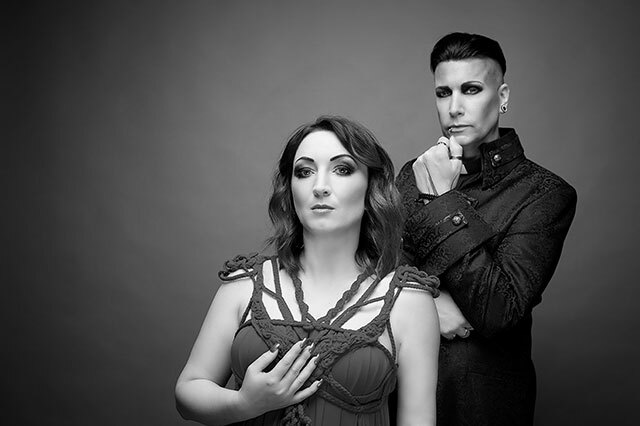 The future is looking bright for the pioneers of Gothic Pop who are out on a limb once again to prove to the world that Pop music and Fantasy are an addictive combination and that there is a lot to discover beyond the realms of hollow “boy meets girl” formulas.